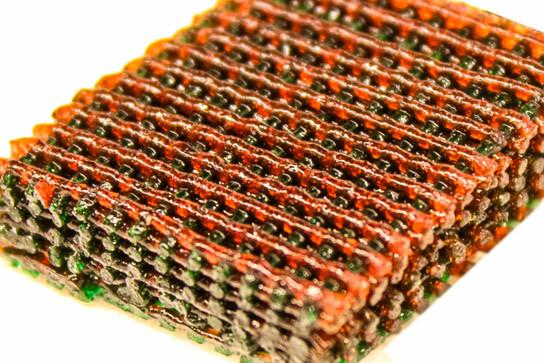 Photo shows the open lattice of 3-D printed material, with materials having different characteristics of strength and flexibility indicated by different colors. Researchers have developed a new way of making tough — but soft and wet — biocompatible materials, called “hydrogels,” into complex and intricately patterned shapes. The process might lead to injectable materials for delivering drugs or cells into the body; scaffolds for regenerating load-bearing tissues; or tough but flexible actuators for future robots, the researchers say. The new process is described in a paper in the journal Advanced Materials, co-authored by MIT associate professor of mechanical engineering Xuanhe Zhao and colleagues at MIT, Duke University, and Columbia University. Zhao says the new process can produce complex hydrogel structures that are “extremely tough and robust,” and compatible with the encapsulation of cells in the structures. That could make it possible to 3D-print complex hydrogel structures — for example, implants to be infused with cells and drugs and then placed in the body. Hydrogels, defined by water molecules encased in rubbery polymer networks that provide shape and structure, are similar to natural tissues such as cartilage, which is used by the body as a natural shock absorber. The new 3-D printing process could eventually make it possible to produce tough hydrogel structures artificially for repair or replacement of load-bearing tissues, such as cartilage. While synthetic hydrogels are commonly weak or brittle, a number of them that are tough and stretchable have been developed over the last decade. However, previous ways of making tough hydrogels have usually involved “harsh chemical environments” that would kill living cells encapsulated in them, Zhao says. The new materials are benign enough to synthesize together with living cells — such as stem cells — which could then allow high viability of the cells, says Zhao, who holds a joint appointment in MIT’s Department of Civil and Environmental Engineering. In addition, the previous work was not able to produce complex 3-D structures with tough hydrogels, Zhao says. The new biocompatible tough hydrogel can be printed into diverse 3-D structures such as a hollow cube, hemisphere, pyramid, twisted bundle, multilayer mesh, or physiologically relevant shapes, such as a human nose or ear. One of the two polymers provides elasticity to the printed material, while the other allows it to dissipate energy under deformation without breaking. A third ingredient, a biocompatible “nanoclay,” makes it possible to fine-tune the viscosity of the material, improving the ability to control its flow through the 3D-printing nozzle. The material can be made so flexible that a printed shape, such as a pyramid, can be compressed by 99 percent, and then spring back to its original shape, Sungmin Hong, a lead author of the paper and a former postdoc in Zhao’s group, says; it can also be stretched to five times its original size. Such resilience is a key feature of natural bodily tissues that need to withstand a variety of forces and impacts. Such materials might eventually be used to custom-print shapes for the replacement of cartilaginous tissues in ears, noses, or load-bearing joints, Zhao says. Lab tests have already shown that the material is even tougher than natural cartilage. In addition to biomedical applications, the same technique could be applied to printing a variety of soft but tough structural materials, he says, such as actuators for soft robotic systems. The team included mechanical engineering graduate student Shaoting Lin at MIT,; graduate students Dalton Sycks and Hon Fai Chan; and professors Gabriel Lopez, Farshid Gullak and Kam Leong at Duke. The work was supported by the National Institutes of Health, the Office of Naval Research, AOSpine Foundation, and the National Science Foundation. Be the first to comment on "New Process for 3D Printing of Highly Stretchable and Tough Hydrogels"